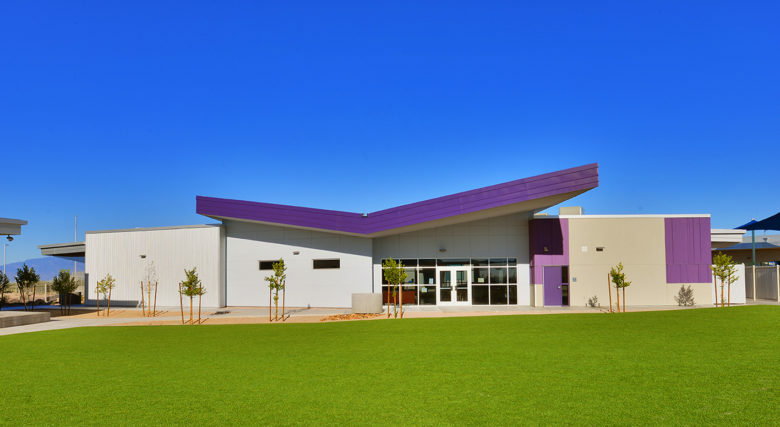 Copper Ridge Elementary School is a 58,000 SF Pre-K to 5 school serving 550 students in the southwestern portion of the Vail School District. The project was designed to accommodate a future 4 classroom, 100 student addition. The school was planned around a central outdoor amphitheater that is used for events and presentations throughout the year. The Library and STEAM classroom building is easily accessed by all students and includes a community meeting room that can be used by students during the day and PTA and other organizations after school hours. Natural daylighting techniques are used throughout the school. Dynamic butterfly roofs at the Admin, Library, and MPR buildings provide visual interest, shade, and highlight the importance of water by directing rainwater into cisterns which feed the surrounding landscape areas. The school and neighborhood association partnered together to create a native landscape demonstration area including a monarch butterfly sanctuary filled with milkweed plants. This entry was posted on June 29, 2017 by swaim_admin.